Published October 25, 2012 By Anna T. This post may contain affiliate links. Regardless, I only recommend sites I've researched and/or used and trust. 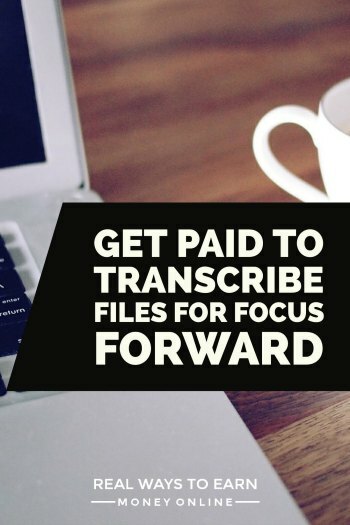 Focus Forward is a company that I see advertising a lot for home-based transcription workers. This is the same company that also does market research surveys (and in fact you can sign up with Focus Forward if you like participating in research and would be interested in answering surveys from them). They have been in business for a long time (since 2003 so almost 10 years) and currently have over 400 U.S. based transcriptionists working for them. Focus Forward handles many different types of transcription, including medical and business. How much does Focus Forward pay? The company hires both English language and Spanish language transcribers. Currently the English language transcribers earn $10 per 15 minutes of sound while the Spanish language transcribers earn far more at $37.50 per 15 minutes of sound. Some jobs may occasionally come with little bonuses attached. The rate for English language transcription works out to $40 an audio hour. The industry standard for experienced transcribers is closer to $60 an audio hour, so the pay here is a little on the lower side unless you can do the Spanish language transcription. Payments are sent out twice a month in the middle and end of each month via either mailed check or direct deposit. There is no option for Paypal here. Do you need experience to do the work? Focus Forward does prefer to hire people with transcription experience. However, you can try their test online and have a shot at getting in even with no experience. You do not have to upload a resume here, so your test is your one shot at getting in. You unfortunately cannot retake the test if you fail it. Does Focus Forward hire people outside the U.S.? No, you must be U.S. based to work for Focus Forward. Is this an employee or IC position? If hired, you work as an independent contractor for Focus Forward. What is the schedule? Is there consistent work? Focus Forward requires that you commit to doing at least four hours of sound per week. You are supposed to let them know your schedule with their scheduling tool so they can send you files when they have them. As is the case with most independent contractor jobs, there is no guarantee of steady work so you can probably expect there to be times when there isn't much to do and also times when there is plenty. As always, have some other work at home job on the backburner if you're hired here just in case you need something else to go to when work is scant. When you receive files, you are usually given about 24 hours time to complete them. Most files are around an hour long. You will need the Express Scribe software to do the work and also a high-speed internet connection. Having Microsoft Word installed on your computer is also a requirement. What is the feedback on Focus Forward? I am seeing a lot of positive reports on this company. The people in charge are apparently responsive to questions and concerns and are nice to work with. I have seen a few people complain that the pay, at $40 an audio hour, is not nearly enough, but then others seem to be content with that rate. The job listing is posted on their site here. I'd also recommend reading through their FAQ here for more details on how it all works. Good luck! I worked for FocusForward for about 10 years. Over the last year, they changed their entire system. Now you download software that connects to a databank in “the cloud.” We used to get whole marketing research groups to transcribe — often 1.5 -2 hrs long. Now, they chop that all up into about 15 to 20-minute pieces and distribute the pieces to different transcribers. It can make it very difficult to know who’s talking or even what they’re talking about. The pay scale also seems to have changed – was considerably reduced for new transcribers, though they said those of us who’d worked with the company would be paid the same. Then they started pricing per-job, not at a standard rate. I don’t work for them anymore. I have just recently found out about Focus Forward Transcription. All of the reviews so far has given me hope that this is a legitimate company to work for. I have 17 years of experience as a medical transcriptionist and have worked with legal and general transcription as well. My question is when applying how manyminutes should I ask for if I have four hours available five days a week to start? Estimate one hour per 15 minutes of audio. So if you have 4 hours per day, take 60 minutes of audio each day. Here’s an updated review of the company. I’ve been working with Focus Forward as a transcriber for about a month now. The application test is pretty straightforward, but you will fail it if you don’t follow their directions (including formatting) exactly. They expect you to get online and look up any unfamiliar words, including medical terminology. It took about two weeks from the time I was accepted as a transcriber until I got my first assignment. They explained fully why there is a delay — they choose an easier, good quality, 30-60 minute audio for first assignments, and they don’t always have those available. The first transcription is fully reviewed and you get written feedback on it. After that, you just get whatever assignments come up. As another poster said, October/November seems to be busy for them. I have received an assignment every day I’ve said I was available, and there are multiple emails about bonus work every day. I am guessing it wouldn’t always be this way, but right now transcribers could basically take on as much work as they want. They expect transcribers to do a minimum of four hours of audio per week to remain active. The pay is $9 per 15 minutes of audio for standard files, so maybe it has gone down since the article was originally written. I’m averaging about $11 per hour, but I type about 90 wpm, accents don’t bother me, and I’m already familiar with medical terminology. From a technical standpoint, the work flows very smoothly. Their scheduling website and FTP site are easy to use. You don’t have to invoice anything because their system keeps track and pays automatically. I’ve had good communication and quick answers from the project managers. Thank you for the updated info, Diane! According to their site, they accept transcribers from outside the U.S.
I’ve worked for Focus Forward since March 2015. My only complaint is the pay. $40 per audio hour might sound like a lot, but it takes about four hours to transcribe one audio hour. And that’s if the audio is perfect. By that I mean no accents, no words to look up, no respondent IDs, no timestamping, and everyone speaking clearly and one at a time. Unfortunately, that is rarely the case. Oftentimes the audio is just plain bad, there are multiple respondents talking at the same time, there are spellings to look up, there is background noise causing inaudibles, there are accents you can’t understand, medical words, words you never heard before, etc., etc., and you rarely make as much as $10 per hour. On the plus side, they usually give you extensions if you need more time. And you don’t have to drive in commute traffic and you get to work at home. And the people that I have dealt with have all been very helpful and very nice. I didn’t pass the test the first time, but I took the same test again and passed. Just read the instructions, pay attention to detail, and proofread it a few times and you should be okay. Can you give me any tips on passing the test transcription? I did the audio, read it, proofed it and thought it was good – but I was wrong. I got rejected but wasn’t told what I did wrong. I was told I could submit the test twice in a year (don’t know if that’s a calendar year or based on when the first test was submitted). I’ve done transcription for a long time, I thought I was good at it so I’m really wondering what I got wrong on this. You have to follow their formatting instructions exactly, and they expect you to get online and look up any unfamiliar words, including medical terminology, to make sure you are spelling and capitalizing correctly. You also have to transcribe the non-related conversation at the beginning and end of the recording. And be sure to save the transcription in the correct file format according to the instructions. Hopefully some of that helps. Thanks for the tips Diane, but I did all that – found the unfamiliar words so I knew their spelling, checked formatting, checked capitalization, transcribed the non-related conversations, read and re-read the piece before I submitted it. I’ve read where some applicants were told what they did wrong but I got absolutely nothing. I think I’ll give it another try this week to see if it’s the same test or if it goes any smoother this time (I really hope so – I have the time plus the people that work for them seem to like it). It took a couple weeks for my first assignment from them after the application was completed. While not explained, I would guess that the delay was due to having to find an audio file without an immediate turn-around that could handle the delay of the devoted QC’er to it for a full check/comparison of the transcript quality. They seem to try to put you into the work flow gradually with easy audio quality to start with. Don’t be surprised if after the first file, there are a few days in between the next one and so on. This lasted about two weeks or so. To me, it seemed to be a valid vetting mechanism to ensure that the audio would be done on time and with good quality. Since that time, audio has been assigned regularly, and pay has always been on time. The project managers that I have worked for have been very helpful and responsive. Just be patient starting out. Also, the period around November/December was absolutely slammed. There does seem to be an ebb and flow, but overall, they’re a great company and I’m very happy to be working for them. Can anyone tell me how long it took to hear back once you completed the application? Hi all, I am curious, can someone tell me what the test is like? Straight transcription? Is it scored immediately? Did you all practice a while or if I have done transcription before and am a fast typist, should I just go for it? THANKS! The test is pretty much straight transcription. They speak nice and slow and clear, which is nice. There is medical terminology and they do expect you to look up the words if you aren’t sure how to spell them. They do verbatim transcription, and you’re expected to include the non-related conversation at the beginning and end of the recording. Caitlin, what did you think about your first assignment? I passed the test and got hired as well and am currently waiting for my first assignment. Just letting everyone know… I was hired by them on Feb 26 and still have not received an assignment from them, in spite of being available 4/5 weekdays for 60-90 min sessions — only a lot of e-mails about rush jobs that are first come first serve. Apparently this is something experienced by a lot of people too. It makes me think they do not have a lot of work available or something, so it surprised me when I saw that they were still hiring. Maybe this is just a one-time thing for new transcribers; can’t say what it’d be like once I got more regular work. But for those applying– you may have a wait in the beginning. Just putting it out there. That is surprising. They are always hiring, I see their job listing posted every single day. As often as I come across their advertisements, I would have assumed they were covered up in work needing to be done. Yes, I’m confused too. I e-mailed them 2 days ago about it so far to no avail (even though they replied to another one of my e-mails about a separate matter). In their policy they state that they may take “a while” to send first assignments to new transcribers, but no specification on how long that actually is. Will update if things finally move forward. Speak of the devil– They gave me my first assignment yesterday. I wonder what was going on! Hey Caitlin, I know you posted this WAY back and may have figured this out by now–but as a generic PSA, this is what I have found. Posting 60-90 min availability in PAM does not qualify you for 45-60 min jobs, of which there are many more. On the other hand, two or three days of 45-60 min availability may net you a 2-3 hour audio file with a longer turnaround time (e.g. 48-72 hours instead of the usual 24). It’s odd that it works this way, and I still have no idea why. Other than that, FFwd has worked beautifully for me–and I came on with zero experience. Quick note on Focus Forward Transcription from a completely objective, self-employed contractor. (No personal affiliation with the company.) I worked with them for a couple of years as an English-language transcriber. They are GREAT! Pay is always on time, project managers are accessible, considerate and responsive with valuable feedback, when provided, work is steady (always more available!) and descriptions/directions clear and accurate, the FTP system is extremely user friendly … I can’t imagine anything running more smoothly, especially after having had a couple very negative experiences with companies that did not pay timely (or at all… especially a certain woman in Florida). I can say with certainty, based on my lengthy experience, that Focus Forward Transcription operates their business with integrity. Thanks so much for your amazing website, very helpful and informative. Just a note on Focus Forward Transcription. I applied with them, did their testing according to all of their instructions and they declined me. They said my work did not meet their criteria. I found it interesting considering I have over 7 years experience as a general transcriptionist so I consider my skills/experience certainly above average. I’m currently doing general transcription for another company and consistently get good feedback, so I don’t know what’s up with FFT. I am considering starting my own transcription service but would have liked to get on board with one or two other companies first. I’ll keep looking but thanks again for your info! Thank you for the kind words, Marina! I am sorry about Focus Forward, but do appreciate you coming here to share your experience with others. Hopefully there will be a better opportunity around the corner.